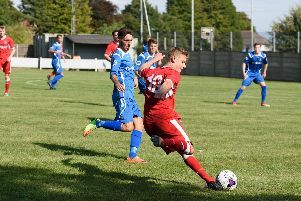 Petersfield Town chairman Graeme Moir has praised caretaker manager Andy Neal for his ‘unbelievable’ work ahead of the club’s first league game of the season. Ian Saunders brought his successful four-year reign at Love Lane to an end last week when he quit the club to take up the manager’s role at Winchester City. That left the Rams with a void to fill but Neal took up the reins immediately and has spent the last week keeping the current playing squad together and making vital additions before their division one central curtain raiser at Chalfont St Peter tomorrow (3pm). Moir has been quick to praise Neal for his tireless work in difficult circumstances and believes his hard graft will bear fruit in the weeks to come. He said: ‘The way Andy has conducted himself in the last week after Ian Saunders left has been exemplary. ‘His commitment and loyalty to the club has been unbelievable – the workload he has undertaken to stabilise the playing side of the club has been sensational. ‘He stepped up from his reserve-team role without hesitation. ‘At times when I see him at the club the phone is glued to the side of his face constantly – taking calls or making them, talking to players and potential new signings. ‘Andy epitomises the spirit running through this club – we never give up, we will always battle on and when the chips are sometimes down or things look really tough we always overcome the obstacles put in front of us. ‘If everyone at Petersfield continues to show those qualities now we will be fine. Saunders took Jamie Ford, Howard Neighbour and Joe Briggs with him to Winchester, while Sean Wain and Ash Howes, who have both joined Wessex League premier division side Blackfield and Langley, are the only other departures from the squad. Ryan Woodford, Harry Wedlake and Matt Corsaro have all been added to the squad travelling to Chalfont – with more signings expected in the coming days – and Petersfield have their sights set on three points. Moir added: ‘With Ian we earmarked this game as a winning start to the season and that is no different despite the changes.